Home » Industry News » How Do You Want To Spend Your Retirement Years? How Do You Want To Spend Your Retirement Years? To view a PDF of this story, click here, and visit hardwareretailing.com/retirement-persona-checklist to download an PDF checklist of the different steps to prepare for your retirement persona. 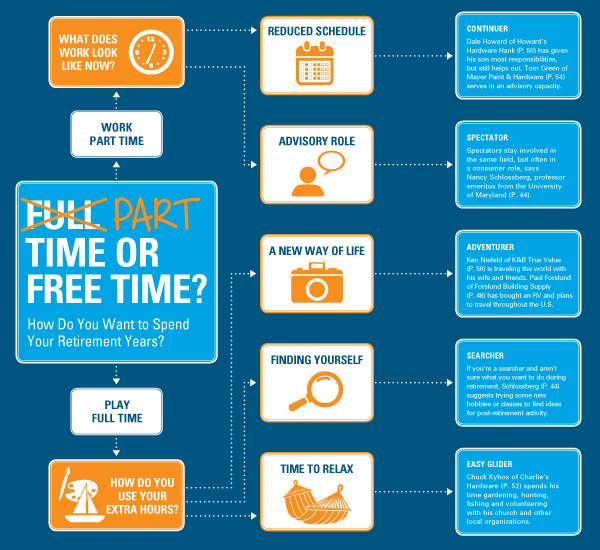 Full Time, Part Time or Free Time? If you’ve gotten your finances in order, created a succession plan and decided where your first vacation will be, you may think you’re ready to retire. However, you could be missing a step or two, such as planning how much or how little you’ll be involved in your business when you’re no longer running it, and how you’ll deal with the transition from full-time business owner to retiree. For many home improvement retailers, the door is open to continue to work part-time, whether that means helping in the office, overseeing advertising and marketing or popping in for a few hours a week to help on the salesfloor. Regardless, you may not have thought through what your relationships with employees will look like when you’re no longer in charge or how you’ll feel when someone else is running your shop. You may wonder what you’ll do when you wake up in the morning and don’t have any particular plans on the calendar. The transition to retirement isn’t easy, and it’s even harder when it involves starting a completely new way of life and letting go of a business you’ve owned and operated for many years. The average independent home improvement retailer is in his or her mid-50s, so retirement might be only 10 or 15 years away for many of you. Even if you have a financial plan in place, you need to start thinking about how to get ready for retirement psychologically. 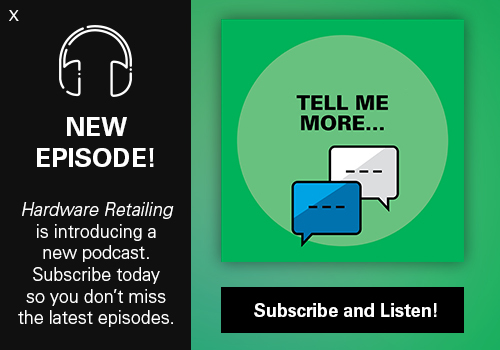 With these complexities in mind, the editors of Hardware Retailing spoke with a psychologist who is an expert on this transition and also talked to some retired retailers. Their stories and suggestions can help retailers who are still at work to think ahead to the more emotional side of the transition to retirement. Read on to learn more about what to expect psychologically when you retire and to discover what your retirement persona may be. Although retirement sounds great in theory, it’s not always an easy shift from the working world to the golf course, no matter how many times you’ve dreamed about it. 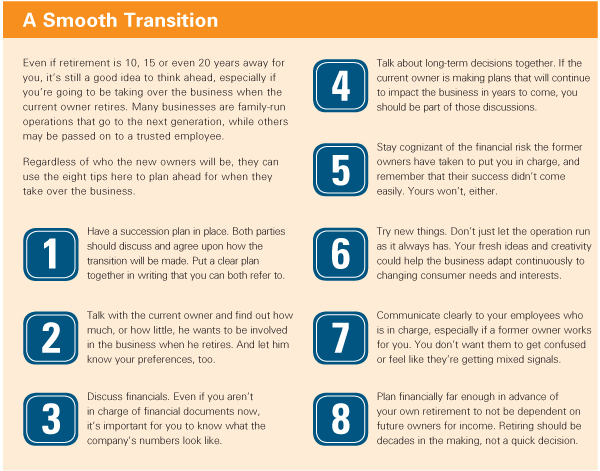 The transition can be especially difficult if the business you’re leaving behind is one you started yourself or took over from the generation before you. “You have relationships with staff and customers, you have routines you’re used to, and you have the way you view the world,” says Nancy Schlossberg, professor emeritus from the University of Maryland, who spent many years as a professor of counseling psychology, has written books on retirement and runs the website www.transitionsthroughlife.com. What Type of Retiree Are You? The first, continuers, are people who want to continue what they’re doing, but in a modified way. 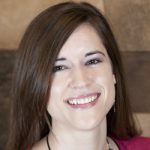 “A continuer might be someone who wants to stay on with the business for a while or work as a consultant,” she says. For a home improvement retailer, that could mean selling the business and cutting back on hours, but still working part-time in the store, whether it be one afternoon a week working the cash register or 20 to 25 hours helping in the office and ordering inventory. Or, you might find you fit in best as a spectator, where you’re involved in the same field, but in more of a consumer role. “For example, a museum director might go to a lot of museums just to browse and see everything they have to offer, rather than working at one in a professional capacity,” says Schlossberg. If you’ve built a career in a particular industry, you’ve gained some knowledge along the way, and it’s something you’re interested in, so it only makes sense that you would continue to be involved in that industry. For a retailer like you, this may mean regular trips to your local hardware store—but as a customer. The key here is to plan ahead. Have some ideas on how to pursue that new hobby when you retire, such as signing up for a photography class or volunteering with a museum. That way, you’ll have done a little of the legwork up front, and when you retire, you can immediately jump into your new adventure. 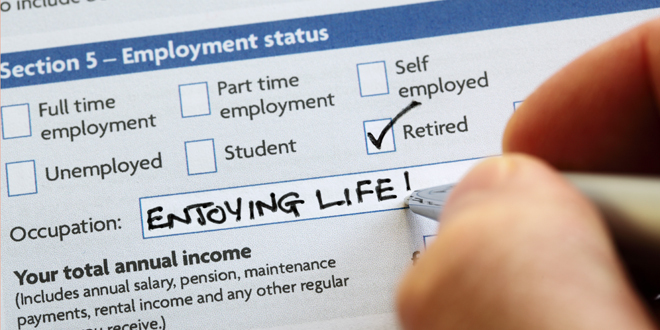 Are you not sure at all what you want to do when you retire, but you’re ready to find out? Then you may be a searcher. If you’re a searcher, try dabbling in a few different hobbies and see what you do and don’t like. Obviously, home improvement is a good starting point. Maybe you want to do some projects around your house, help family and friends with theirs, or volunteer your time doing small repairs for local organizations. Or maybe you want to try something completely different. 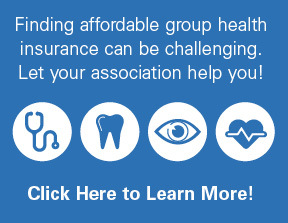 Sign up for classes, talk with friends, and see what activities are available in your area. Try new things until you find the one that’s right for you. As you look forward to retirement, you may find you’re an easy glider. 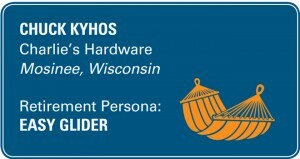 “Easy gliders say, ‘I’ve worked hard; I’ve built a business. I’m tired and I just want to enjoy myself and let each day unfold,’” Schlossberg says. If you fall into this category, you might find yourself taking day trips, babysitting or working on your regular hobbies, but you don’t have too much scheduled—you just take it one day at a time. The one category you don’t want to find yourself in is that of a retreater, Schlossberg says. “Retreaters generally end up just hanging out at home, being couch potatoes and not doing anything,” she says. “They often become depressed, so of course this is something you want to avoid. The key, she says, is to do some thinking before retirement to determine which path you think you’ll want to follow. And she says to try and make transitions gradually. If you already know what hobby you want to pursue, you can start on it while you’re still working. Then, when you retire, you’ll have already gotten a good start and can devote more time to it. If you know you want to cut back on your time in the business but can’t imagine going from full-time to working 10 hours per week that quickly, take a few months, or even a year or two, to cut back on hours gradually. This will not only help you get used to your new schedule, but it will help your staff adjust, too. We spoke with five retailers who have recently retired or are in the process to get their thoughts and tips on the transition and find out what they’re doing now. 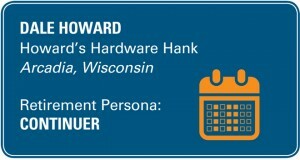 To start planning, take a look at our checklist by visiting www.hardwareretailing.com/retirement-persona-checklist. 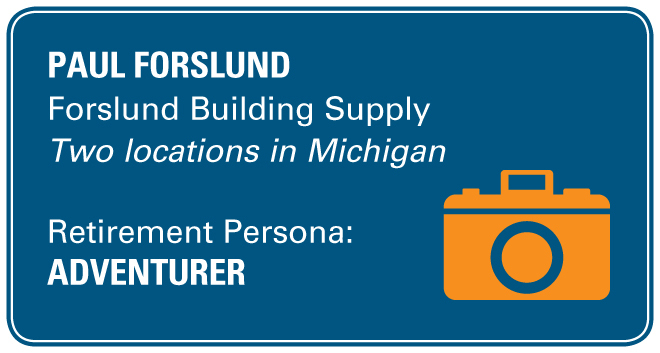 Paul Forslund’s parents opened Forslund Building Supply in 1950, when he was just 2 years old. By age 10, he was helping with odd jobs around the store. He continued to help after school and during summers in high school and college. After he graduated from college, he came back to the store to work full-time. “I’ve had about every job in the business—delivery, buying, learning all aspects when I was young,” he says. When he was 34, Forslund’s parents chose semiretirement. 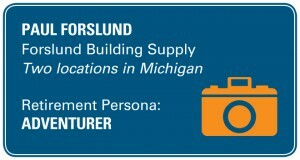 Forslund took over running the business’s day-to-day operations and bought out his parents over a period of time. Now, Forslund and his son, Gus, are in the process of doing the same. Forslund retired in January and Gus has taken over the business. Ironwood and Caspian, the Michigan towns where the two Forslund stores are located, struggled considerably during the recession, Forslund says. But in the past couple of years, the economy has started to pick back up. That and some health issues helped Forslund make the decision of when to retire. Paul Forslund, left, retired in January. His son Gus, right, has taken over the business. In a few months, Forslund will be there much less often—he and his wife have already purchased an RV and plan to do some traveling, especially during the winter. “We’re going to take our dogs with us and head south for three or four months,” he says. “My parents had a home in Florida for years, so there are some areas I’m especially familiar with that we’ll visit. We have friends and relatives all over the country, so we’ll visit the ones in warmer climates. Other items on his bucket list? Visiting Alaska and devoting more time to hobbies such as hunting and fishing. “I didn’t have as much time to do these things while I was working,” he says. Forslund says that while making the decision to retire was a tough one, the transition, despite being scary, was easier than he’d originally expected. 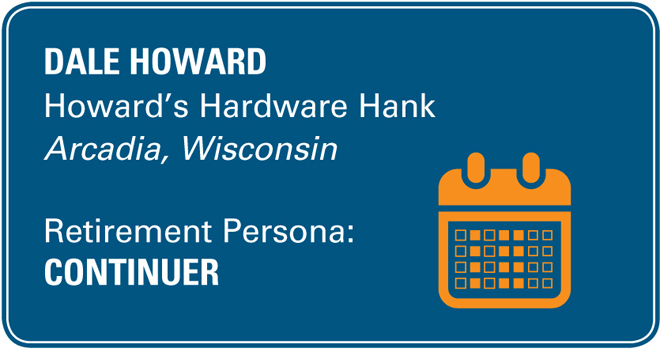 Dale and Christine Howard, who oversaw their family business until nearly three years ago, still work daily at Howard’s Hardware Hank in Arcadia, Wisconsin. But turning management of the store over to their son Seth means they can now set their own hours, and spend about half as much time at the business as they did when they managed it. He and Christine had purchased the store in 1976 from his father, who had bought it in 1955 from an owner outside the family. The couple still owns the store. They considered their own health problems and their son’s better ability to use technology creatively to manage aspects of the business when choosing semiretirement. Plus, working about 70 hours per week and bearing the stress of managing the entire operation were tiring. Dropping down to about 30 hours a week and shedding the stresses of management have been good for them, and they plan to continue working at the store while their health allows it, Dale says. “We’ll be around to help our son as long as we can,” he says. The Howards never left the business, even for a transition period, when Seth took over management. Instead, they took more time away from the store. Dale and Christine Howard of Howard’s Hardware Hank continue to help their son operate the store. They began to take leisurely mornings and spend extra time researching the family tree instead of spending most of their time working on the business. Dale is active in the community, serving on the city of Arcadia Plan Commission and on the board of directors for the Arcadia Credit Union. Christine serves on a local Internet, telephone and cable co-op’s board of directors. Dale wants to use semiretirement to take extra fishing trips, and eventually make a visit or two to Europe. 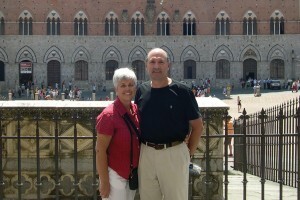 He and Christine would like to take quick trips throughout the U.S., as well. The reduced work schedules mean he and his wife will be able to be more spontaneous about when they travel, rather than planning a year in advance, Dale says. The Howards like having a more relaxed daily schedule, but full retirement isn’t a path they want because they still like their work. “I like the give and take, the things that come up, the challenges, the responsibility. It’s something that I need,” Dale says. In addition, retired friends have advised him to stay involved at the store. 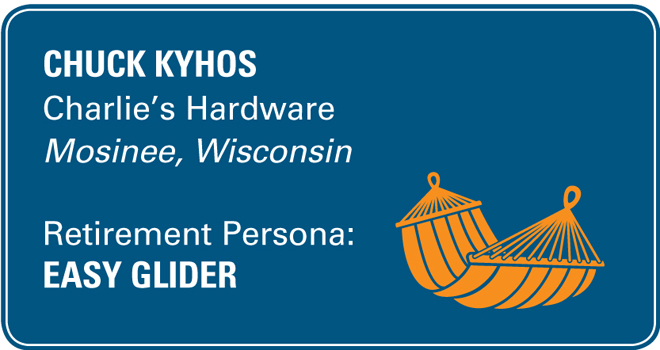 From small engine repair to plumbing work to lawn mower repair to window installation, Chuck Kyhos did it all during his time at Charlie’s Hardware. His parents started the store in 1957, and he grew up working there. 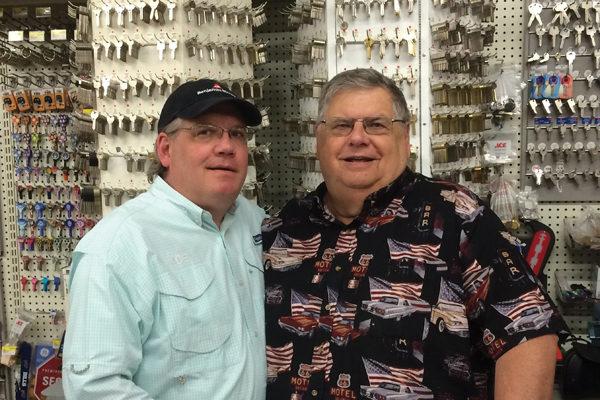 He and his wife, Cathy, bought the store from his parents in 1972. 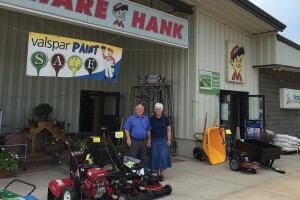 He handled the day-to-day operations until about six years ago when they sold the store to their son, Jeff, and his wife, Pam. Chuck fully retired in June 2014. The retirement took time, and Chuck and Jeff planned it together. Once Jeff expressed his interest, and he and his dad confirmed Jeff’s siblings weren’t interested in being part of the company’s future ownership—“We checked with them, and they said they appreciated the offer but were happy where they were,” says Jeff—the two began making plans. They decided that Chuck would stay on for five years after selling the business to help make the transition easier. “I came and went as I wanted, usually working about four days a week until the full retirement last year,” Chuck says. “We both agreed on my schedule. He said I was more than welcome to stay, and I said I wanted to stay a while, but without working 70 hours a week. 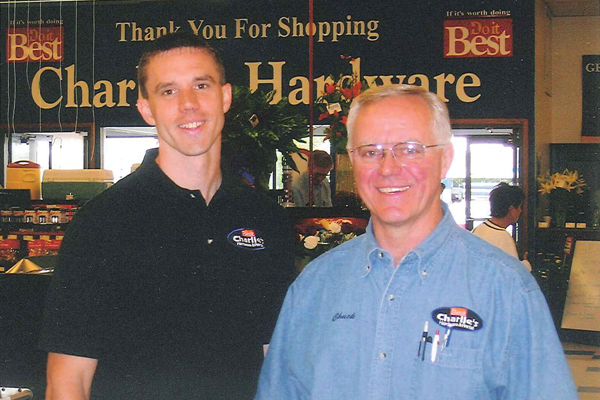 Jeff Kyhos, left, bought the business from his father, Chuck, five years before Chuck retired. The two say the transition plan worked well. During the changeover, the two let employees know about the new ownership, but kept things quiet around customers unless asked directly. Both agreed it was a good move, offering a smoother transition that kept customers from worrying about store changes resulting from new ownership. The biggest challenge of the new ownership, they say, was reminding employees, who would often go to Chuck with questions. But he’s pleased with his successor. 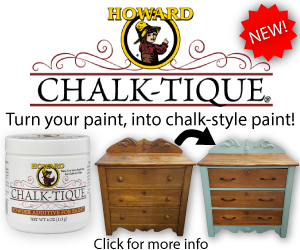 “I was very fortunate the business could stay in the family and I could help in the beginning. It’s not the easiest thing to walk away, but I think that made it a little easier. Over the past year, Chuck has been spending even less time in the store, and is enjoying the flexibility retirement has to offer. “I don’t have too many set things to do day in and day out. I can just wake up and decide what I want to do each day,” he says. Retiring was an abrupt change for Tom Green, who injured his back and had to drop his work hours from 50 per week to four per week in 2012. Tom and his wife, Barb, had bought Mayer Paint & Hardware in Rochester, New York, in 1971, and grew the business for more than 40 years. 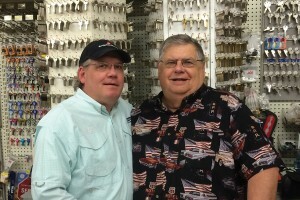 They took a 1,500-square-foot building and a meager hardware business and turned it into a thriving, nearly 5,000-square-foot store. After Tom fell and hurt his back three years ago, he soon missed the hours at the store and his involvement with home improvement-related associations. He is a past chairman of the North American Retail Hardware Association (NRHA) and was also active in local and state organizations. “When you’re running 90 mph for 40 years, it’s really hard to put the brakes on,” Tom says. However, his son Tommy and daughter-in-law, Sara, now operate the store, and serving as his son’s advisor has kept him in tune with what’s happening in the business. “I still do a lot of micromanaging, because you don’t spend 40-some years in the business and just forget about it,” Tom says. Tommy began working full-time at the store in 1980, and over the years took on increasing managerial responsibilities. 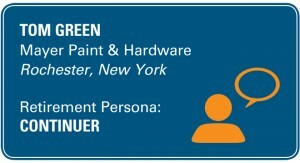 The more recent transition from Tom and Barb to Tommy and Sara leading Mayer Paint & Hardware was like history repeating itself. Tom is available by phone to offer advice and insights from his decades of working in the business. 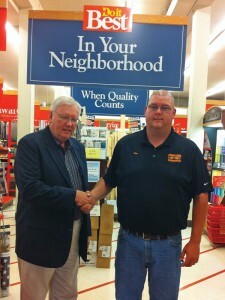 Tommy has led the store to annually increasing sales, and Tom has given him full operational responsibility. 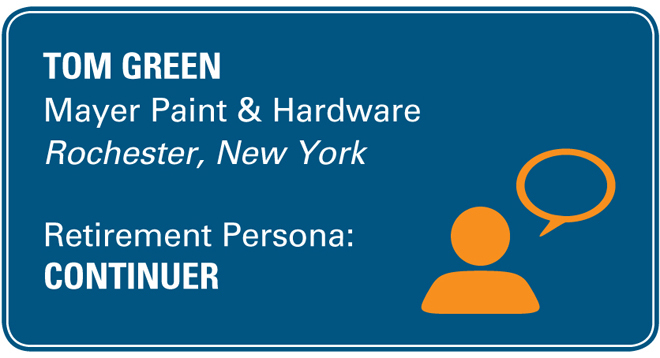 Now that he is retired, Tom Green’s primary role at Mayer Paint & Hardware is advisor to his son Tommy, who oversees the business. “He’s been doing such a good job that he really deserves that, and Barb and I are smelling the roses a little more now than we did before,” Tom says. Tom and Barb have settled into spending more time with their children, who both live less than 3 miles away, and their grandchildren. The Greens are also close friends with their neighbors, so they now spend more time with them, as well. In addition, they added to their family when they got a dog. Tom doesn’t have hobbies like golf, but he continues to read all hardware publications and co-op email updates. He didn’t have a succession plan in place when he retired, and he doesn’t recommend the route he’s taken. He and Barb only recently began working out some details of leaving the store to their children. Planning makes more sense financially, and in other ways, such as emotionally, if you don’t have a qualified family member in line to take over the business, Tom says. But his son’s skills gave him the peace of mind not to make formal plans, he says. “When you start passing on everything you’ve worked so hard for for so long, it’s a big move. But when it’s your own flesh and blood, it’s not quite so bad, as long as you have trust,” Tom says. Ken Niefeld phased himself out of leadership at K&B True Value when his son-in-law Jared Littmann wanted to buy the store. Niefeld had already cut back to working four days a week instead of six or seven, and Littmann had worked for him at the store for four years and was a bright and capable successor. Retiring made sense. Littmann took on more responsibilities, and Niefeld and his wife Bobbie began taking longer trips to their Florida home. 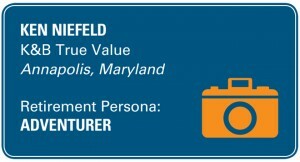 Niefeld made himself available as a mentor, but he often chose to keep away from the business to avoid being intrusive. He wanted to provide institutional knowledge without telling his son-in-law what to do. The Niefelds would answer questions about loss prevention or other retailing issues if Littmann asked them. “I’ve kind of graduated from that role, as well. Jared has been in that role long enough to know what he’s doing,” Niefeld says. 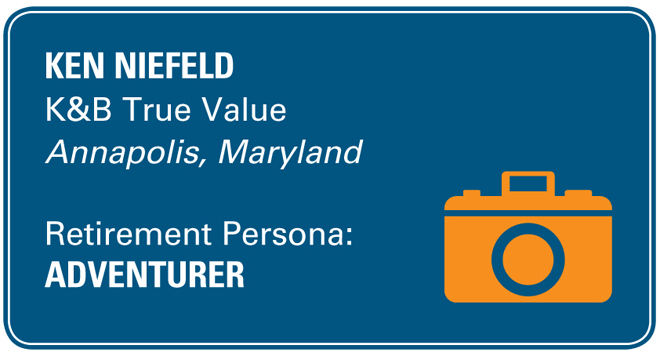 Six years after Littmann took over, the Niefelds’ relationship with K&B is primarily as customers, and Niefeld has created new daily routines as a retiree. He heads to the gym three times a week, plays tennis, goes to the driving range to hit golf balls and takes a tai chi class. 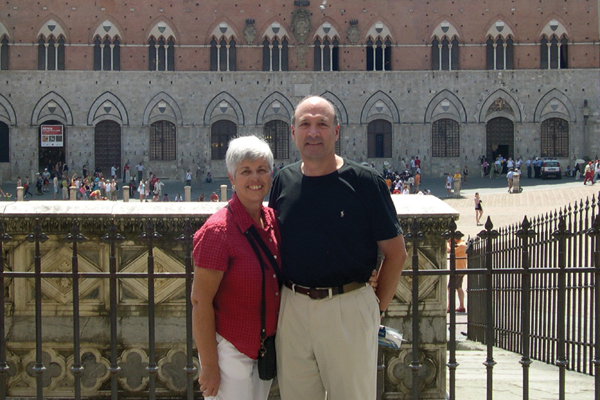 Ken and Bobbie Niefeld (pictured in Italy) have fully retired from operating K&B True Value and enjoy traveling the world together. He also spends extra time taking his wife on lunch and dinner dates, and they regularly travel abroad with their friends. 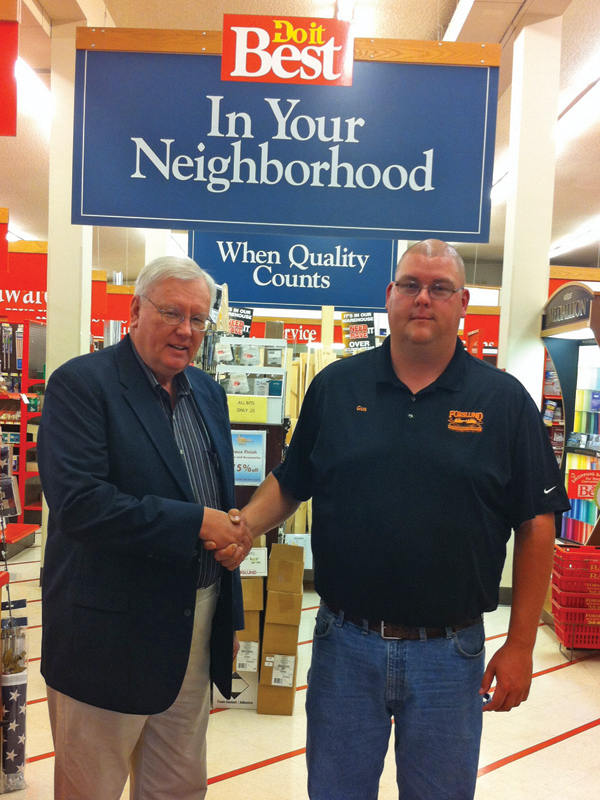 Niefeld started K&B True Value in the 1970s, and he and his wife worked at the store for more than 40 years. They knew selling the business to retire could come with financial and emotional difficulties. A risk in selling a business is that if it fails under new ownership, then the prior owners could lose their retirement income, Niefeld says. He recommends being very careful to give ownership to people, whether they’re family members or not, who have the ability to run a business successfully. Besides the financial investment, he has a lot of pride wrapped up in the store’s success, he says. In 1974, he had opened the business in a 4,000-square-foot space, and in 1985 turned it into a 10,000-square-foot anchor store for a shopping center. He and his wife have seen thousands of community members come through the doors as customers and have a lot of time, assets and income invested, Niefeld says. He stopped interacting as much with new employees as he stepped back, and he directs workers he knows to take work problems to Littmann. “I don’t want to come between Jared and them, because he’s their boss,” he says. The store, though, is sort of like a child—even when you’re not raising it anymore, you still care about it, Niefeld says. He thinks of his new role as that of a supporter.